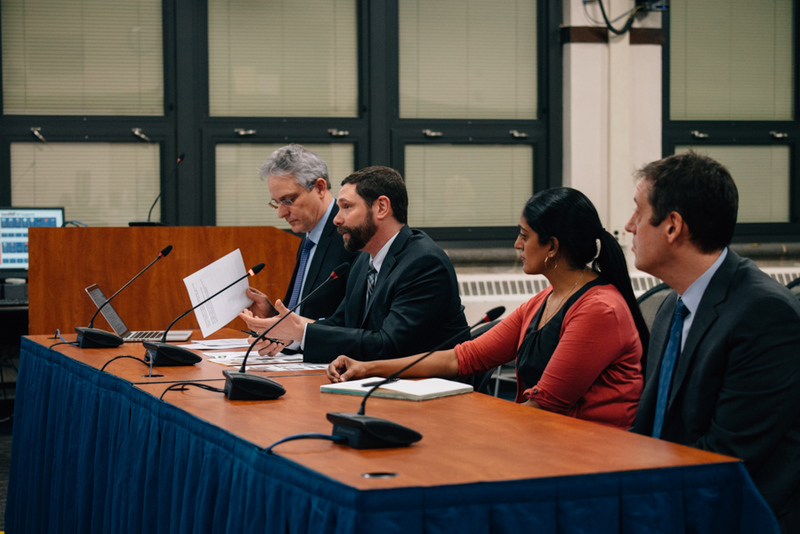 Evanston Township High School/District 202 board members evaluated an increase in students of color taking Advanced Placement courses and scoring a three or higher on exams, bearing in mind continued racial disparities in performance. Four members of teamASAP — a group of administrators and staff at ETHS working to ensure all students have access to advanced placement classes and other opportunities — presented the information to the board on Monday. In 2018, 132 black students took AP exams, and 49 percent scored a three or higher. Since the adoption of a District-wide equity statement in 2011, there has been a 33 percent increase in black student participation and a 68 percent increase in Hispanic student participation in AP classes. However, 606 white students took AP exams with 80 percent scoring a three or higher. Josh Brown, an English teacher at ETHS and co-recruitment and retention coordinator for teamASAP, said the group is creating a space on campus for students of color to be heard and validated. He added that he was struck by how many students reported feeling isolated or left out in their AP courses. Board member Monique Parsons stressed the importance of making students of color feel like they belong in an AP class setting. For Parsons, the presentation indicated where ETHS is and where it needs to be, but she still isn’t satisfied. In addition, Parsons called for the report to address how many black students started an AP course and then dropped it. According to the report, all public universities and community colleges in Illinois were required starting with the 2016-2017 school year to award college course credit to students who submit scores of three or higher on College Board AP Exams. In addition, earning a three or above on four AP exams can provide a semester’s worth of credit, potentially saving students thousands of dollars on tuition at a public university in Illinois. Board president Pat Savage-Williams said when ETHS adopted the equity statement, the district also made the decision to encourage students of color to explore classes and opportunities they had not taken before. She added that white students need to hear and reflect on what their peers have to say because they don’t understand how different their classroom experiences are from their non-white peers.